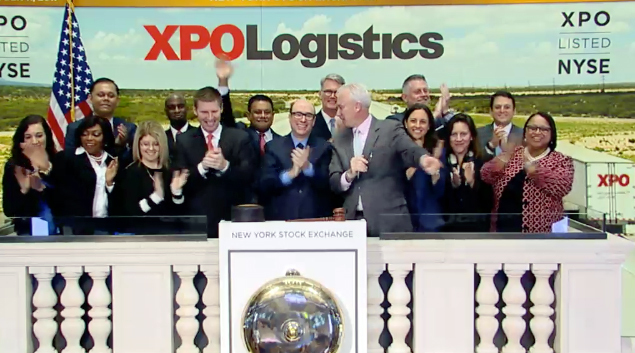 Greenwich, Conn.-based transportation and delivery services company XPO Logistics was the top performing U.S. company on Forbes’ list of Growth Champions, released Oct. 10. Between 2015 and 2016, XPO’s revenue rocketed from $7.6 billion to $14.6 billion, according to Forbes. Founded in 1989, XPO has 50,000 customers and 90,000 employees, according to its website. XPO ranks No. 3 on the Transport Topics Top 100 list of the largest North American for-hire carriers. XPO credits much of its success to keeping pace with the explosion of online shopping and other online business transactions. Retail and e-commerce deliveries — more than 35,000 every day — make up a quarter of the company’s revenue. In the New York City metropolitan area alone, XPO couriers make 7,000 deliveries a day. XPO ranked No. 8 on Forbes’ list of Growth Champions, following businesses in the United Arab Emirates, China, South Korea and Saudi Arabia. The next American company, a New York-based investment trust, came in at No. 13. To create the list, Forbes partnered with Statista to measure the revenue growth of the world’s 2,000 largest companies — known as the Forbes 2017 Global 2000. XPO ranked No. 1,603 on that list, which measures not only sales but market value, profits and assets.